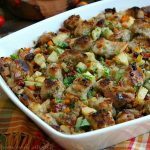 This Thanksgiving Apple Pecan Stuffing recipe is a delicious blend of buttery bread cubes, apples, and pecans. Place the onions in a small bowl and sprinkle the sugar over them. Let onions sit for about an hour. In a large skillet saute the carrots, celery, apples, and garlic until softened. Strain the sugared onions and add them to the saute along with the melted butter. Add mixture to the bread and toss in a large bowl. Add chicken broth to the bread mixture along with the pecans, parsley, and Beau Monde seasoning, slowly tossing until the broth is all absorbed by the bread. Spoon into a well-greased 3-quart or 13- x 9-inch baking pan. Cover with foil and bake at 350°F for 45 minutes. Remove foil and continue to bake for 5 - 10 minutes or until top is crusty and brown.